Dance Marathon at Florida State University was recently awarded the Campaign Activation Award at the Miracle Network Dance Marathon Leadership Conference in July. The Campaign Activation Award recognizes an outstanding campaign implemented by a dance marathon program that utilizes targeted efforts and provides unique content to increase awareness, participation, and engagement for a dance marathon program. 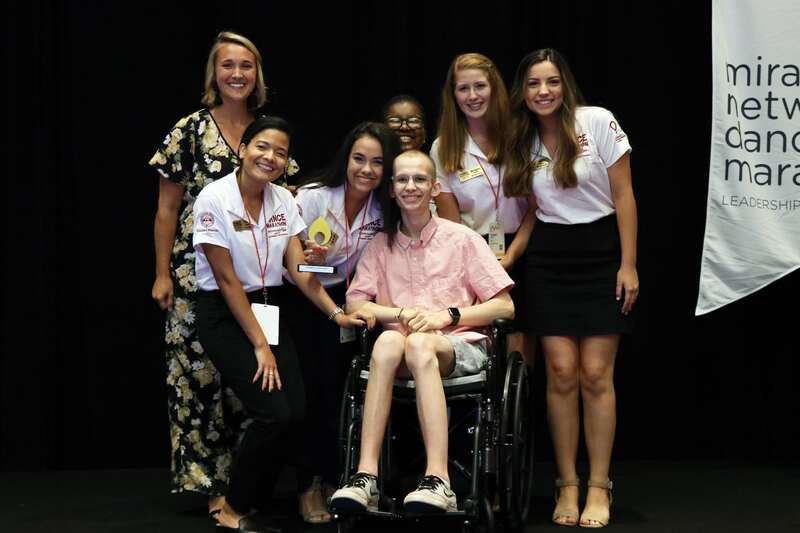 DM at FSU receives the Campaign Activation Award at DMLC 2018 from Riley Hospital for Children patient, Tyler. In the fall of 2017, a hurricane devastated Dance Marathon at FSU’s local area leaving them wondering what they could do to help unity their community. Through their 2018 campaign, UpToUs, they were able to connect the Florida State University and Tallahassee communities to their cause. It was important to them to continue fighting for children being treated at their local Children’s Miracle Network Hospital, University of Florida Health Shands Children’s Hospital. To keep Dance Marathon at FSU’s brand for the UpToUs campaign consistent, the Marketing and Publicity and Technology teams collaborated to create a logo and a video that promoted the need for each individual to find their reason for connecting with the cause. It wasn’t until they decided on a $2 million financial goal that UpToUs became Up2Us. By combining the message with the goal, Dance Marathon at FSU saw their community embrace the campaign. For the past 23 years, Dance Marathon at Florida State University has strived to create a better tomorrow for the kids of today. Last year, we asked you to #DoMore. This year, it’s #UpToUs. It’s Up To Us, as individuals, as an organization and as a community to give hope for tomorrow. By using guerrilla marketing, team members and dancers changed their Facebook cover photos to showcase their new logo and took campus by storm hanging up more than 5,000 flyers. The university was covered with Up2Us campaign materials. Local media outlets began sending out press releases and created various stories covering the campaign. Marketing efforts reached even further when dancers from participating organizations across Florida State University’s campus featured #Up2Us in their own organization’s social media posts as signs of support for the cause. In 18 days, we will commence our 23rd Dance Marathon, but this week we are dedicated to highlighting our WHY and how every person on and off our campus can unite in the fight to help create awareness for our cause! It’s #Up2Us to challenge ourselves this week to be the light for the kids of Shands Children’s Hospital and Gadsden County. In the weeks leading up to Dance Marathon at FSU’s marathon, #Up2Us week, helped highlighted their message through a social media campaign on Instagram. They exchanged the “us” in Up2Us with other individuals who help Dance Marathon at FSU fight for the kids including Up 2 Our Community, Up 2 FSU, Up 2 You, and Up 2 Me. On our last day of Up To Us week, we want you to share how it's #Up2Me. It is Up To Me to leave my legacy and be the reason someone else is able to hit their milestone. Today, we encourage each and every one of you to highlight your friends who truly embody the concept of #UpToUs and donate at least $5 to one of them participating in DM. During their marathon, they had their own Up2Us wall showcasing a mural of photos and messages dancers posted to themselves, their miracle kids, and those who inspired them to dance.